Her Holiness Khadro Crystal Chu Rinpoche is the lineage holder and spiritual leader of the Fifth Stage of Black Sect Esoteric Buddhism, the designated successor to His Holiness the late Grandmaster Lin Yun, the CEO of Yun Lin Temple, the Chairman of Taipei Lin Yun Foundation, and an Adjunct Professor at the School of Arts and Letters in San Diego State University. Designated by His Holiness the late Grandmaster Lin Yun as his successor, H.H. Khadro Crystal Chu holds the responsibility of carrying on the lineage of the religion, running the operations of the non-profit organizations, transmitting all of H.H. Grandmaster Lin Yun’s invaluable teachings, cohering the Black Sect Esoteric Buddhist communities, providing consultations, and conducting all the services. For more than three decades, H.H. Khadro Crystal Chu Rinpoche studied and travelled extensively with H.H. Grandmaster Lin Yun all over the world. She was instrumental in organizing almost all of H.H. Grandmaster Lin Yun’s work, including worldwide lectures, workshops, retreats, Feng Shui consultations and field trips, Buddhist services, blessings, personal consultations, and book publications. Alongside H.H. Grandmaster Lin Yun, Khadro Crystal Chu met with many national leaders, religious leaders, enlightened spiritual teachers, entrepreneurs, renowned scholars, high profile figures, as well as countless people all over the world. The thorough training and tutelage she received under H.H. the late Grandmaster Lin Yun has made her the leading authority on all of the Black Sect Esoteric Buddhist teachings, a cultivated high-level spiritual teacher, a meditation master, and an experienced and authoritative Feng Shui educator. H.H. Khadro Crystal Chu received her BA from National Taiwan University and her MBA from University of Georgia. In 1986, her professional experience in corporate management at a San Francisco high tech company empowered her to help H.H. the late Grandmaster Lin Yun in founding and managing the Yun Lin Temple in Berkeley, California, the first temple of Black Sect Esoteric Buddhism at Fourth Stage. The establishment of Yun Lin Temple marked a milestone for later development of Black Sect Esoteric Buddhism, the Yun Lin Temple Cultural Center in Berkeley, the Lin Yun Monastery in New York, and the Lin Yun Foundation and its new Neihu Temple in Taipei, which were established in 1994, 1996, and 2008 respectively. Since 1986, Khadro Crystal Chu has hosted all the supreme leaders of the five main traditions of Tibetan Buddhism as well as many high lamas and Buddhist masters to give initiations and teachings at these locations. In 1998, both His Holiness Grandmaster Lin Yun and Her Holiness Khadro Crystal Chu Rinpoche were enthroned by His Holiness Lungtok Tenpai Nyima, supreme leader of Tibetan Bon tradition and 33rd Abbot of Bonpo Mentri Monastery. This extraordinary enthronement signifies the deep spiritual connections among H.H. Grandmaster Lin Yun, H.H. Khadro Crystal Chu, and the Black Sect Esoteric Buddhism and the Tibetan Bon traditions. In 1987, H.H. Khadro Crystal Chu Rinpoche, together with H.H. Grandmaster Lin Yun, had the privilege of introducing the Fourth Stage of Black Sect Esoteric Buddhism to the Pacific Council for Inter-Religious Dialogue of Vatican and of meeting with the late Pope John Paul II. In 2002, H.H. Khadro Crystal Chu was invited to attend the Global Peace Initiative of Women Religious and Spiritual Leaders Conference in Geneva, Switzerland. H.H. Khadro Crystal Chu organized the International Non-China Experts Discussion on China Issues Conferences in Berkeley in 1989 and in Taipei in 2004. Since 1999, she has been a panelist at the annual conferences held by the American Association for Chinese Studies. H.H. Khadro Crystal Chu has been Adjunct Professor at the School of Arts and Letters in San Diego State University since 1999. She has been a regular guest speaker at Feng Shui Group, Women’s Guild, and Enlightenment Society of UNSRC of the United Nations since 2003. She has been the guest speaker at six different International Feng Shui Conferences across the USA, Europe, and the Caribbean. She has lectured at Harvard, Stanford, New York University, San Diego State University, Dana-Farber Cancer Institute of Harvard Medical School, London University, George Mason University, National Agriculture University in Beijing, Taiwanese-Canadian Cultural Association, Whole Health Expo, Taipei Rotary Club and so forth on Ch’i, Feng Shui, holistic healing, and meditation. H.H. Khadro Crystal Chu is the publisher and editor-in-chief of the Yun Lin Temple calendar, which is published annually. She has published more than 300 articles about Black Sect Esoteric Buddhist teachings, Buddhist philosophy, philosophy of life, spiritual and personal growth, and Chinese folklore in the Yun Lin Temple calendars. She was the publisher of the Yun Lin Temple Newsletter. Recently H.H. Khadro Crystal Chu was interviewed by a California based TV station KMVT on Feng Shui. Since the passing of H.H. 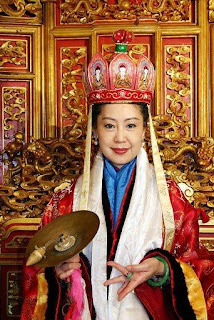 Grandmaster Lin Yun in August of 2010, Her Holiness Khadro Crystal Chu has led worldwide workshops and classes, lectures, and meditation retreats. She has been presiding over wedding blessings, conducting the Temple’s various services and activities, coaching and mentoring all disciples and students, providing Feng Shui and personal consultations, implementing a new Feng Shui master training certification program as well as new meditation and spiritual growth retreat programs. Topics of her teachings and lectures include the theory of Ch’i, Feng Shui, holistic healing, Yin-Yang philosophy, applications of I-Ching, divinations, Buddhist teachings, meditation, spiritual and personal growth, sacred transcendental cures, and Chinese folklore. She remains deeply committed to perpetuating the legacy of Black Sect Esoteric Buddhist teachings and practice.